We have frequently posited on these pages that the BBC’s long-standing policy of avoiding the use of the word ‘terror’ and its derivatives on the grounds that such use would constitute a “value judgement” is in fact a value judgement in itself. The recent terror attack in Nairobi seems to have brought the subject of that self-inflicted abstinence into the arena of public debate. The Daily Telegraph reported that “[t]he BBC is under mounting pressure to end an effective ban on the use of the word “terrorist””. “The corporation has drawn criticism during its coverage of the Kenyan massacre for describing the perpetrators as “militants”. Rob Wilson, Conservative MP for Reading East, said the BBC was “out of touch” on the issue. 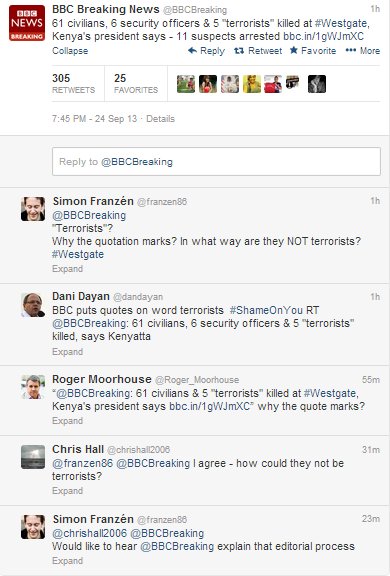 Reactions to a Tweet sent from the BBC Breaking News account on September 24th corroborate Mr Wilson’s gauging of public opinion. Members of the public can make their opinions on this subject (and others) known to the BBC Trust by taking advantage of the ongoing consultation on the subject of BBC news and current affairs content. 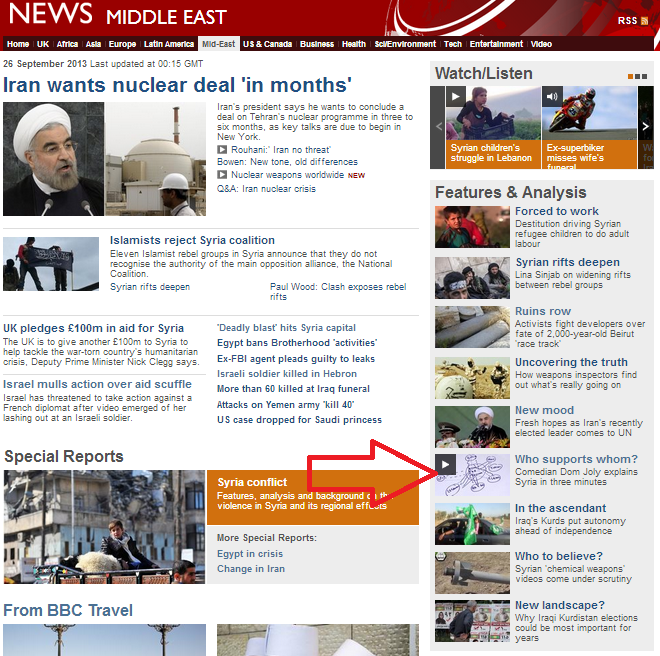 We have previously noted on these pages that – despite the BBC ECU having upheld a complaint on the subject in 2010 – BBC backgrounders on the subject of the second Intifada (along with several additional articles which also continue to be available on the internet) still advance the narrative according to which Mohammed al Dura died from Israeli gunfire at Netzarim junction in September 2000. 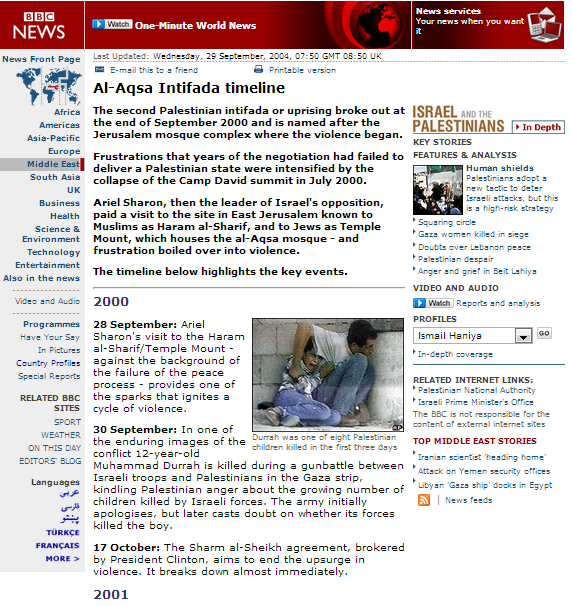 Another narrative advanced in the two backgrounders which use al Dura’s image (as well as in other articles still available online) is that of the visit of Ariel Sharon to Temple Mount on September 28th 2000 as the cause of the second Intifada. Notably, neither article mentions that violence actually began the previous day when terrorists detonated roadside bombs near Netzarim, killing Sgt David Biri. Equally remarkable is the fact that the entry for the year 2000 in the “Al Aqsa Intifada Timeline” neglects to mention the killing of Border Police Supt. Yosef (Yossi) Tabeja by his Palestinian counterpart whilst on a joint patrol on September 29th 2000, the Palestinian besiegement of Joseph’s Tomb in Schem on October 1st 2000 – in which Border Police Cpl. Madhat Yusuf was killed – or the October 12th 2000 lynching of First Sgt. Vadim Norzhich and First Cpl. Yosef Avrahami at Ramallah’s police station. Whilst the catalyst for the intifada is attributed in that timeline to Sharon’s visit to Temple Mount and the sole casualty mentioned is Mohammed al Dura, the fact that 52 Israelis were killed by Palestinians (including members of Fatah-linked terror organisations and PA security personnel) between September 27th and December 31st 2000 is apparently deemed unnecessary information for BBC audiences. But do the known facts support the BBC’s promotion of the Palestinian narrative according to which Sharon’s thirty-four minute visit to Temple Mount during normal opening hours – which had been pre-coordinated with the Palestinian security forces – was the spark which inevitably ignited the second Intifada? In November 2011 Arafat’s widow spoke on PA television of the preplanned nature of the second Intifada. 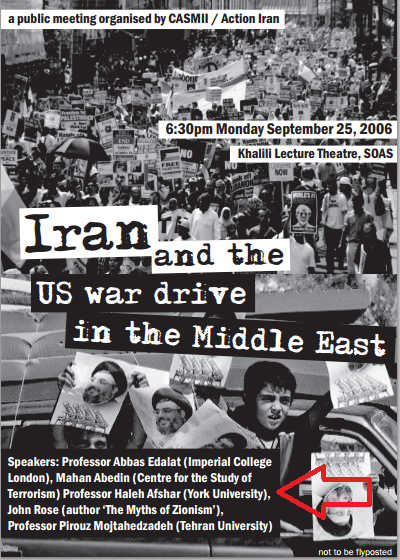 Imad Faluji -PA Minister of Communications at the time of the Intifada – described the second intifada’s advance planning in December 2000 both on film and as reported by the pro-Fatah newspaper ‘Al Ayyam’. Many more examples of Palestinian statements regarding the second Intifada’s advance planning and the PA’s organization of it and participation in it are available here. But beyond the obvious inaccuracy of the BBC’s presentation of Sharon’s visit to Temple Mount as the cause of the second Intifada, there lies a deeper question. Why does the BBC apparently automatically assume that even if Palestinians did consider that visit provocative, they could not choose to refrain from rioting and violence? 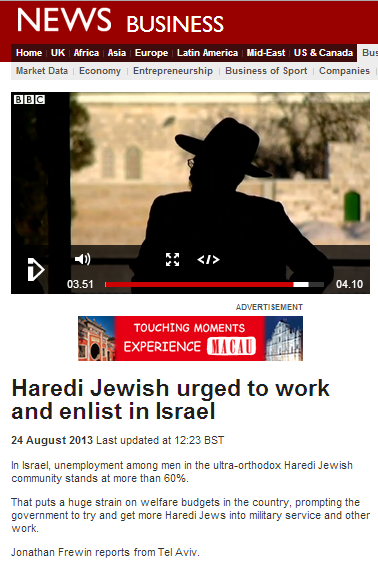 Some might say that such an obvious display of bigotry of low expectations compromises the BBC’s impartiality. It really is high time for the BBC News website to have a spring cleaning session and remove the many inaccurate, partial and misleading items which visitors searching for factual information will still come across. 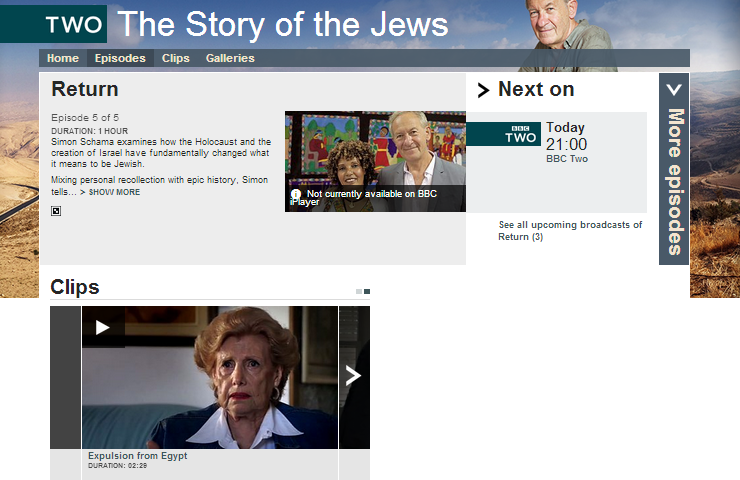 A reminder for UK-based readers: the fifth and final episode – titled “Return” – of Simon Schama’s documentary “The Story of the Jews” will be shown on BBC 2 at 21:00 tonight – Sunday, September 29th 2013. Whether or not this is the same “Palestinian villager Yacoub Odeh” as took the BBC’s former Jerusalem correspondent Wyre Davies on a tour of Lifta in May 2011 remains to be seen, but if it is, readers might like to find out more about Mr Odeh the professional political activist, and his remarkably selective memory, here. For those who may have missed them, the previous four episodes of Simon Schama’s documentary are available to view in the UK on BBC iPlayer. The series will apparently be broadcast in the coming spring in the United States. On Friday September 27th 2013 violent demonstrations (unreported by the BBC, as was a rocket attack that same night) took place in several locations in Jerusalem, the Gaza Strip and Judea & Samaria as Palestinians marked the 13th anniversary of the beginning of the second intifada. Several Israelis were injured. 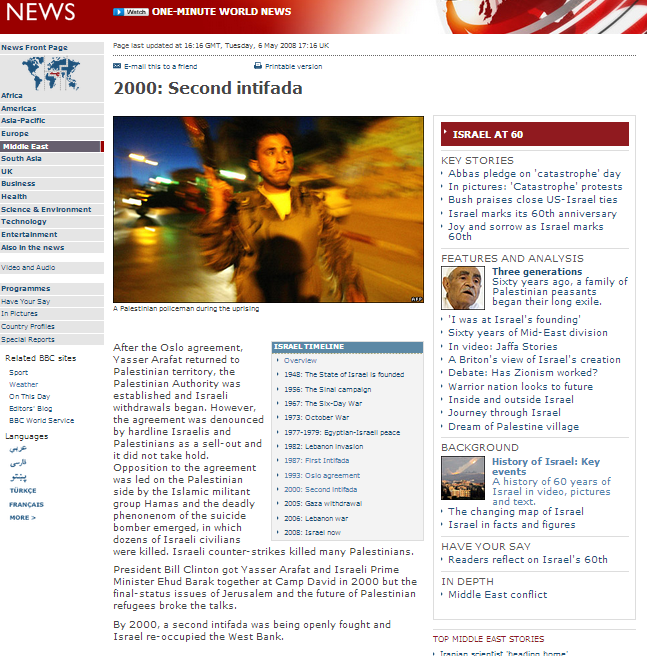 A BBC audience member searching for information regarding the second Intifada on the corporation’s website would – among other items – come across an article titled “2000: Second intifada” which forms part of the BBC’s “Israel Timeline”. The second Intifada commenced on September 27th 2000 with a roadside bomb attack on a convoy of civilians, escorted by IDF soldiers, en route to Netzarim. Sgt. David Biri, aged 19, was killed in that attack and another soldier was injured when they got out of their vehicle to check on the civilians – including a baby – after the first IED exploded. Hence, for the first nine months of the year 2000, a second intifada was not “being openly fought”, contrary to the statement made in this article. Likewise, the suggestion that “Israel re-occupied the West Bank” in the year 2000 – as any reasonable reader would understand this sentence – is clearly inaccurate. Only at the end of March and beginning of April 2002 – eighteen months after the beginning of the second Intifada – did Israeli forces enter the six Palestinian Authority-controlled towns of Ramallah (29/3/2002), Tulkarem, Qalqilya (1/4/2002), Bethlehem (2/4/2002), Jenin and Schem (3/4/2002) in Operation Defensive Shield. The BBC’s suggestion that “Israel re-occupied the West Bank” is also inaccurate in light of the fact that no Israeli forces were present in other towns such as Jericho and Hebron. In the year and a half prior to that operation, hundreds of Israelis had been killed and injured by Palestinian terrorists, with the month of March 2002 alone seeing the deaths of over a hundred Israelis, including thirty people killed in the Park Hotel attack on March 27th. Not only does this BBC backgrounder fail to reflect the campaign of terror which lead to Israeli forces having to enter PA controlled areas, but it also fails to make any mention of the foreign donor funded Palestinian Authority’s encouragement, organization and financing of that terror war. The article also makes no attempt to inform readers that as an initial result of Operation Defensive Shield, suicide bombings fell by 46%. Clearly, this BBC backgrounder contributes nothing to audience understanding of the second intifada and the fact that it has remained online for over five years whilst promoting such major inaccuracies indicates that the BBC’s system of checks and balances is sorely lacking. If listeners are interested in hearing a potted version of the BBC World View regarding the Iranian nuclear issue, the September 26th edition of the Today programme provides just such an opportunity. It also underscores two themes which the BBC appears to be doing its utmost to promote and amplify. Starting at around 1:33:32 in this recording (available for a limited period of time) presenter John Humphrys introduces a segment of the broadcast which includes an interview with Israeli government spokesman Mark Regev with the following words. There is the first BBC promoted theme: audiences are not invited to make up their own minds as to whether a few strategically chosen words in interviews, speeches – and perhaps Tweets too – signal anything which can realistically be described as ‘moderation’. They are not even encouraged to ponder the question of what a “moderate approach” is in a regime which supports and enables regional dictators and terror organisations, which dictates the dress code of half its citizens and which discriminates against, imprisons and executes its own civilians for adhering to the ‘wrong’ religious or political views. No – the BBC made up its mind that Rouhani is a ‘moderate’ practically before he had opened his mouth and BBC audiences are being kept firmly in line with that view, with no chance of reality being allowed to get in the way. During the interview with Mark Regev – which was also featured on the BBC News website’s Middle East page – Humphrys promotes another BBC theme: that of equivalence between a repressive theocratic dictatorship and a working multi-cultural democracy. At 3:06 Humphrys interrupts Mark Regev again – deftly changing the subject from Iran’s activities in the Syrian civil war. Amazingly, the senior presenter of the BBC’s flagship current affairs programme appears to have completely failed to grasp that in the wake of the recent Syrian chemical weapons debacle, the West’s relevance in the Middle East in general – including what it wants Israel to do or not to do – has been diminished by the performance of the very countries he cites – the US and the UK. Humphrys’ focus on chiding the Israeli spokesman for his government’s refusal to have its UN delegation sit through Rouhani’s speech means that BBC audiences learn nothing with regard to the pro-forma anti-Israel rhetoric in the speech itself, Rouhani’s assorted Holocaust questioning and diminishing interviews with the Western media or the fact that just days before his UN appearance, Rouhani presided at a military rally (unreported by the BBC) in Tehran complete with calls for Israel’s destruction. 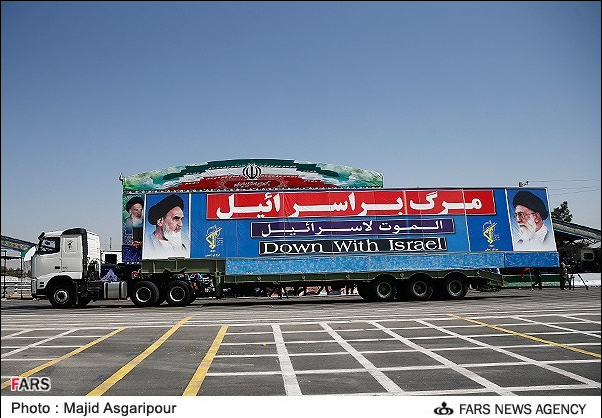 “Iranian President Hassan Rohani took part in an event in which there were calls for the destruction of Israel just days before the United Nations General Assembly. The subject of how Iran ‘paints itself’ is obviously not an issue for the cultural relativists of the ‘Today’ programme, but nevertheless, BBC audiences have the right to expect to be informed of the entire picture – not just the themes the BBC is keen to promote. 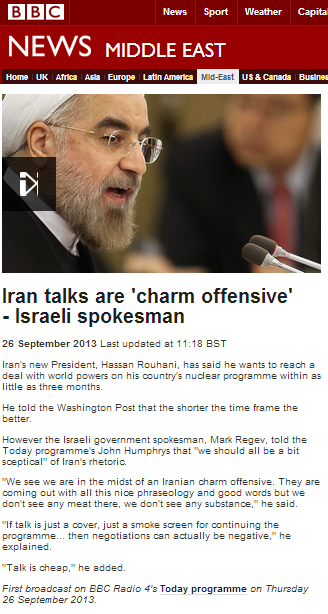 Does the evidence support the BBC’s touting of “less hardline Iranian stance” on nuclear issue? As anyone who has entered into e-mail correspondence with the BBC regarding a complaint will be aware, replies often include a standard footnote which begins with the following sentence. Whilst one assumes that this is a standard disclaimer inserted for legal reasons, it is nevertheless absurd that official BBC replies to complaints made by its funding general public are flagged as “not the views of the BBC unless specifically stated”. A BBC licence fee payer would of course expect to be the recipient of nothing less than “the views of the BBC” in communications regarding a complaint. Readers may have noticed a link titled “Who supports whom?” – with the subheading “Comedian Dom Joly explains Syria in three minutes” – appearing in the ‘Features & Analysis’ section of the BBC News website’s Middle East page over the past few days. That link leads to a brief film clip in which Joly appears to confuse even himself with his ‘analysis’, drifting from “more supportive of” to “couldn’t bring themselves to support” whilst barely stopping for a breath. 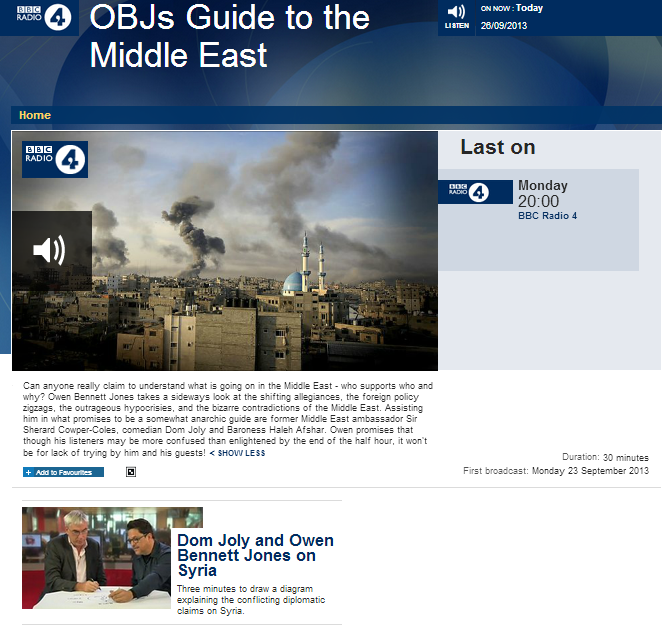 The programme promoted at the bottom of the synopsis to that film clip – “OBJs Guide to the Middle East” – was broadcast on BBC Radio 4 on September 23rd and can be heard here. Contrary to the impression given in the synopsis, Sherard Cowper-Coles does not appear in the programme – Robert Fox of the London Evening Standard takes part instead. Owen Bennett Jones’ other guests are Dom Joli and Baroness Haleh Afshar who is described merely as having “a very international background”. If listeners can manage to get past Afshar’s incessant, inane giggles without hitting the ‘stop’ button, they will be able to hear the Muslim Brotherhood’s Yusuf Qaradawi described at 13:14 as “an Islamic cleric” and “a well-known man”. They will, however, hear nothing about Qaradawi’s infamous homophobia, misogyny or antisemitism. Bizarrely, the producers of this programme apparently did not consider it necessary to inform listeners that the clip had been edited. Listeners might be tempted to dismiss Afshar’s jaundiced remarks as the inept ramblings of someone shoe-horned into the pose of ‘Middle East expert’ on the basis of having been born (and spent a few childhood years) in that region, but one aspect of Afshar’s background – about which the BBC does not bother to inform its listeners – puts those remarks in quite another light. In other words, there are mechanisms in place to ensure that BBC audience’s are not subjected to partisan opinions disguised as impartial expertise, but those mechanisms cannot be effective if the BBC ignores them – as it has done in this case and others. It is completely unacceptable that the BBC does not inform its audiences of the fact that Baroness Afshar has a history of activity with CASMII – the Campaign Against Sanctions and Military Intervention in Iran – which is linked to (and conducts a public relations campaign on behalf of) the Iranian regime. A filmed report for BBC television news by the BBC’s Middle East business reporter Jonathan Frewin from September 21st was also posted on the BBC News website’s Middle East and Business pages and still appears on the former five days later. Here is a screenshot from another report by Frewin which appeared on August 24th – spot the similarity? Not only footage is being recycled; the two reports include interviews with the same economist and the same unsourced predictions of population growth rate in the ultra-orthodox sector in Israel. 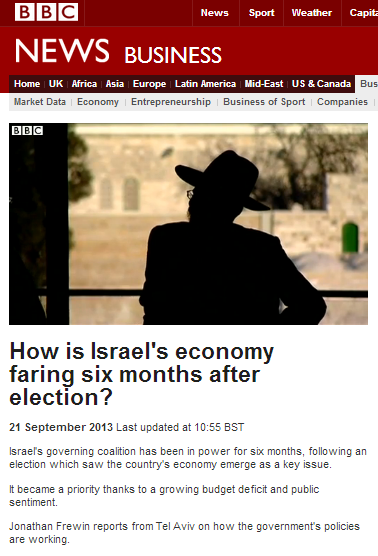 Are BBC audiences really in need of two reports on this internal Israeli issue in less than a month? 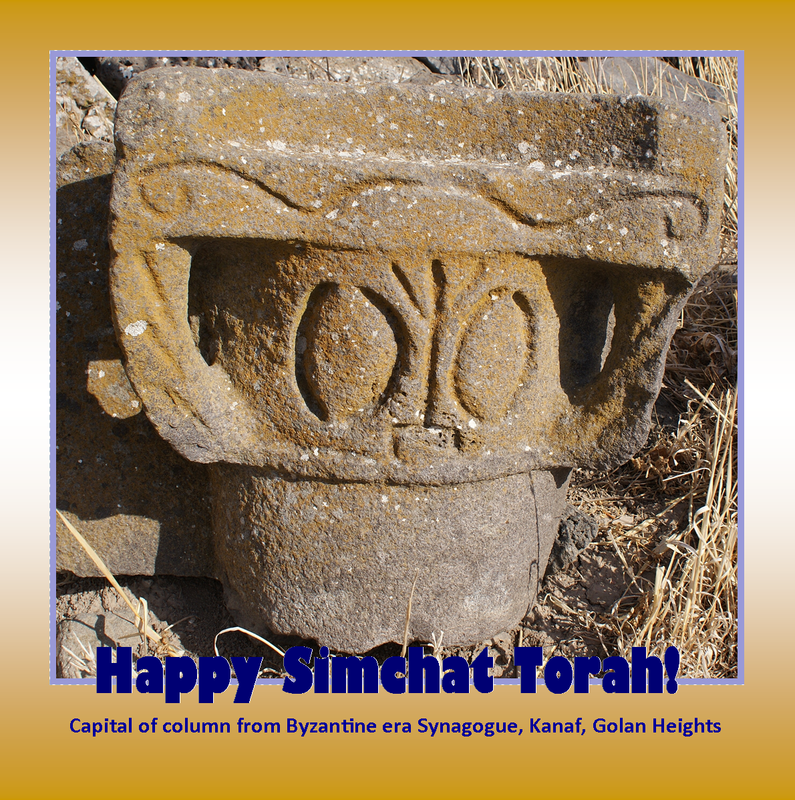 For more on the ancient Synagogue at Kanaf, see here.